We were so lucky to have the culinary talents of Chef Carl (head chef of the Merewood Hotel) at our recent Easter Feast Skills Café. 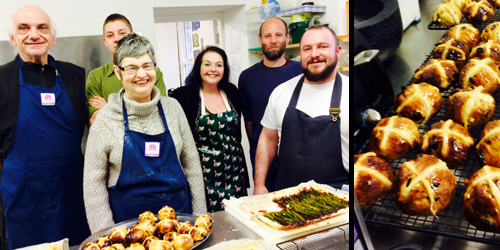 He inspired us to make fresh asparagus tarts and homemade hot cross buns. A heavenly meal to celebrate Easter. He will be joining us again on 25 April with some more cheffy skills to share for a sausage-themed Wednesday morning session!